It’s a busy time of year for the grandstands team at Audience Systems, with enquiries for their instant pitchside grandstands at a higher level than ever before. Last summer, grandstand production was running at full capacity with more and more clubs looking for quick, simple and durable ways to add extra seating, and this year looks to be another record year! Last summer’s customers included Southam FC, Thornbury Town FC and Jarrow FC. 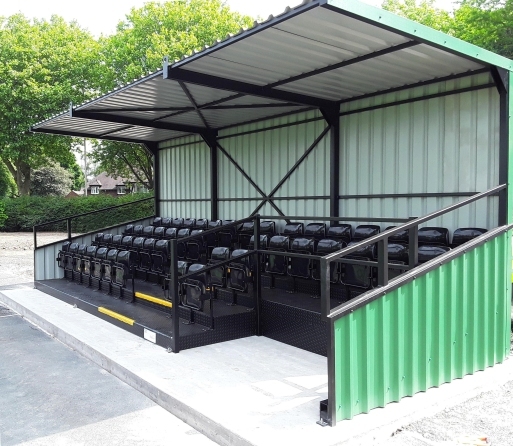 Audience Systems’ Premier Grandstands are fully compliant with relevant codes and standards and offer a simple, modular approach to adding seating – specify 50 or 75 seats (or any multiple), and the grandstands arrive fully built and ready to fix down and use. 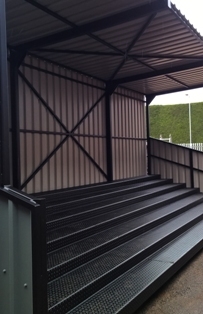 Grandstands can be seated or standing, with many possible layouts and options including wheelchair cutouts, Perspex sides, and a wide range of colours and finishes. Martin Corrigan, Buildings, Systems and Estates Operations Manager from Dudley College, who recently had a stand delivered, said: “I found Audience Systems to offer an excellent service from initial enquiry through to delivery on site. For more information, visit Audience Systems’ Premier Grandstands page where you can also download a full datasheet, or call the grandstands team on 01373 865050.